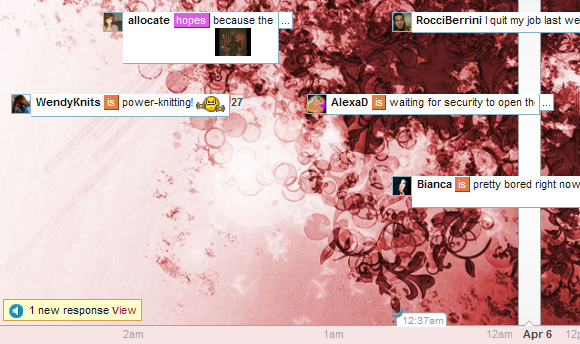 Rather than in a vertical list, updates (plurks) appear on a horizontal timeline. When you scroll through the timeline you will pass date borders and scrolling over a plurk you’ll see exactly when it was posted. The timeline can be filtered for all plurks, my plurks, private (plurks only you received) or responded (plurks you responded to). New responses or updates are indicated by a small status window in the bottom left. Once you click view, you will filter for all plurks with new responses. Furthermore, you can select for responses within the four different categories. The alert for new responses remains until you mark all as read. Updates appear as small previews with a minimized profile photo on the left and the number of replies on the right. To view the whole post you move the mouse over the preview and to view replies you click on it. This is the biggest difference to Twitter: there are actual conversations going on since replies are associated with the original update. Hence, comments are not lost within a long list of chronical updates. On Twitter there is no incentive to maintain regular updates. Karma changes that on Plurk and Karma stands for regular updates and popularity. If you don’t update at least once every 12 hours or when you lose followers your Karma will drop. With regular updates, responses to your plurks, increasing number of followers and friends your Karma will slowly rise up to 100. With a Karma over 20, 40 and 60 you’re climbing the ladder and receive more features. For example you’ll be able to change your Plurk creature or access exclusive emoticons. Frankly, Karma has been a real pain when you went on a vacation. But now you can freeze your Karma, i.e. send it on a vacation along with you. It costs you 1 Karma point, but that’s less than what you will lose. Additionally to Karma you can receive badges for reaching various milestones. 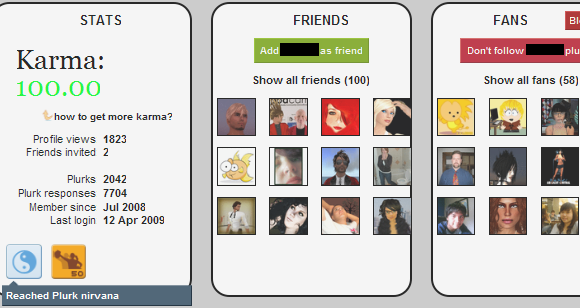 There are badges for having more then 50 followers, reaching Plurk nirvana or inviting more than 25 people. The badges are displayed below your timeline, along with several more stats, joined to the right by friends and fans. This is the next best difference to Twitter. 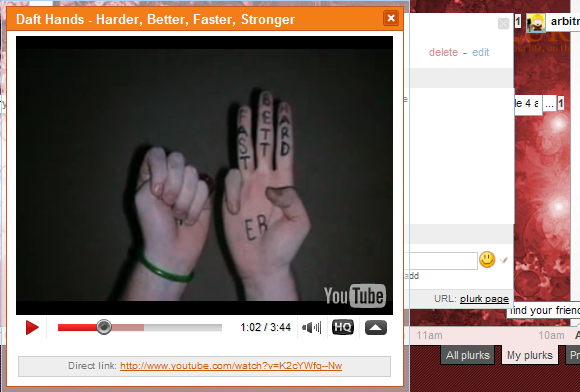 Plurk recognizes links to YouTube, Flickr, TinyPic, ImageShack, and Photobucket and includes them in your update. That means your followers no longer have to open a new window to view your link, they can view your photos or videos within Plurk, which is extremely convenient. 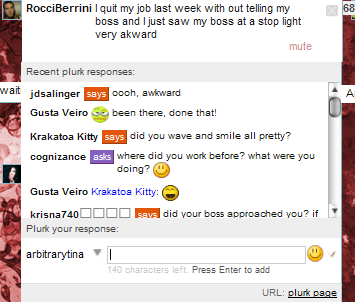 Plurk now offers status updates for Twitter, Friendster, Facebook, and Multiply. That way you can stay in touch with all of your friends on other sites without having to make individual updates to each of these. Unfortunately, the integration is only one way. At this point you will not be able to see Twitter updates on Plurk.